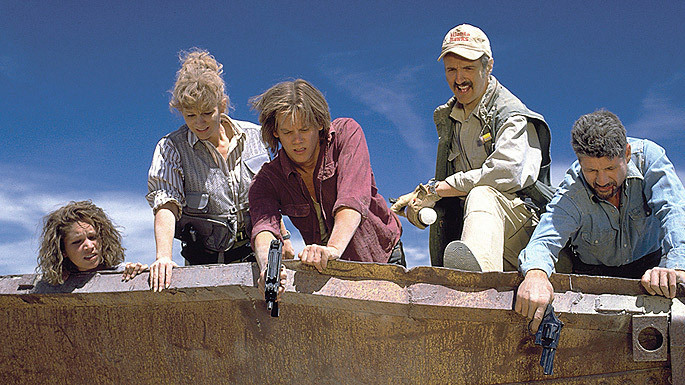 Could ‘Tremors’ Make A Come Back With Kevin Bacon?! Kevin Bacon is interested in another ‘Tremors‘ movie!! We first saw the humongous, man-eating worms tearing up the desert and anyone who got in its way 25 years ago. This movie gave us everything. a 1990’s Bacon saving the day, witty repartee aplenty and a gun-crazy Reba McEntire. The film went on to spawn 3 sequels, none of which was as popular as the first one. There isn’t a company with plans in motion for a ‘Tremors‘ project, yet, but this may change shortly. Most of the time a network will be interested in exploring the options once they know a star is already on board and considering the constant replication of older movies or series into current projects, I can see this as an excellent fit. Any potential film doesn’t have to stay strictly with a big screen opening in mind anymore, either. With same day digital release options and streaming providers entering the original content market there has to be someone that would be happy to host this, I’m talking to you Netflix, Hulu, Crackle and Amazon. Who’s ready for some more motherhumpers?! Kevin Bacon Returning To ‘Tremors’ With TV Series For Syfy!!! Kevin Smith will Now Make a Sequel to ‘Jay and Silent Bob’! This entry was posted on Friday, May 15th, 2015 at 2:53 pm	and is filed under Film, News. You can follow any responses to this entry through the RSS 2.0 feed. You can skip to the end and leave a response. Pinging is currently not allowed. « ‘True Detective’ Season Two Looks Incredible! You're gonna have to figure that out for yourself.